A Gold Club Discounts membership identification card is available for all of our customers who would like to request that we send you an ID card in the mail. The vast majority of our discounts and savings can be accessed directly online in our exclusive membership area without the need to have a Gold Club ID card in your possession. However, some local merchants in your area may require you to show your Gold Club identification card before you can obtain access their savings promotions. In an effort to keep our monthly membership costs down for all of our members (just $11.65 per month) and to "think green", we do not automatically mail out our Gold Club ID cards to all customers unless you contact our customer service team and request to receive one. You can request to receive a Gold Club card at anytime by emailing customerservice@GoldClubDiscounts.com or by calling (800) 646-8140. 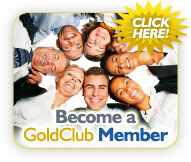 We will then mail you your very own Gold Club Discounts membership ID card within 3 to 4 business days. Thank you.